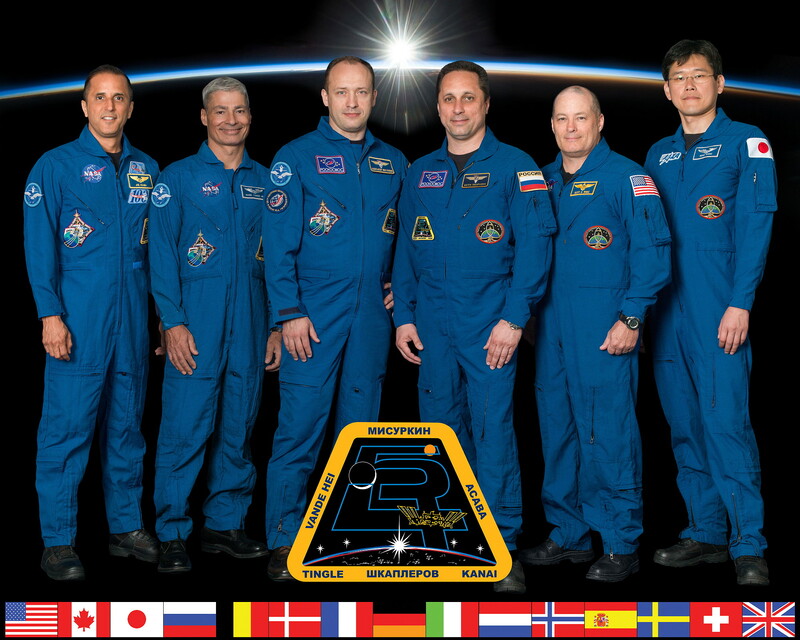 ISS Expedition 54 began with the undocking of spacecraft Soyuz MS-05 on December 14, 2017 at 05:14:28 UTC. The former Expedition 53 (Sergei Ryazansky, Randolph Bresnik and Paolo Nespoli) returned safely to Earth. NASA commercial cargo provider SpaceX launched its 13th commercial resupply services mission to the International Space Station at 15:36 UTC on December 15, 2017. 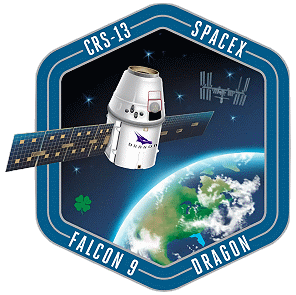 Loaded with almost 4,800 pounds (2,170 kg) of research, crew supplies and hardware, the SpaceX Dragon spacecraft (CRS-13 or SpX-13) launched on a Falcon 9 rocket. Dragon delivers several science investigations to the space station, including a NASA instrument called Total and Spectral Solar Irradiance Sensor, or TSIS-1, which will measure the Sun's energy input to Earth, and a fiber optic payload. 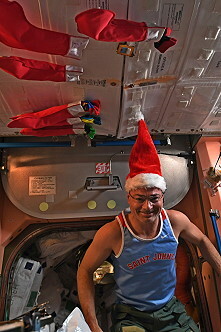 Also manifested on this flight is an investigation sponsored by the Center for the Advancement of Science in Space known as Biorasis - Glucose Biosensor, which seeks to improve the accuracy of a wireless medically implantable continuous glucose biosensor for day-to-day diabetes management. On December 17, 2017 Mark Vande Hei and Joseph Acaba captured Dragon using the space station's robotic arm (10:57 UTC). 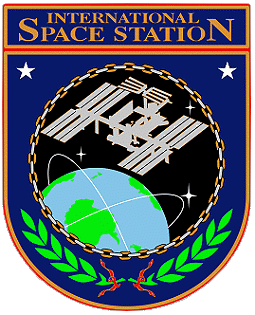 Ground controllers then sent commands to robotically install the spacecraft on the station's Harmony module (13:26 UTC). Following a two-days solo flight Soyuz MS-07 docked to ISS on December 19, 2017. 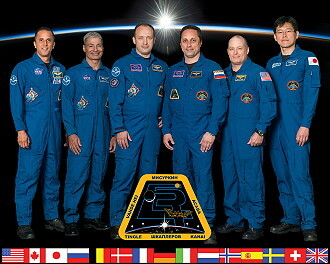 Anton Shkaplerov, Scott Tingle and Norishige Kanai became the ISS Expedition 54 (together with ISS Expedition 53 crew members Aleksandr Misurkin, Mark Vande Hei and Joseph Acaba). 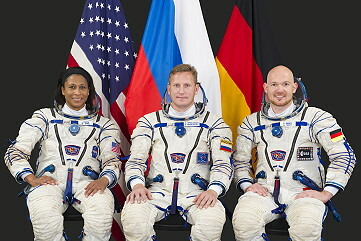 With the arrival Expedition 54 became a six-person-crew. Filled with trash, the unpiloted Russian cargo ship Progress MS-06 undocked from the aft port of the Zvezda Service Module of the International Space Station at 01:03:34 UTC on December 28, 2017. 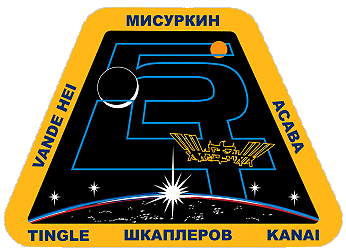 Just after 04:00 UTC, Russian flight controllers sent commands to fire the Progress' engines and deorbit the space freighter, sending it to a destructive entry over the unpopulated south Pacific Ocean (04:51:34 UTC). After delivering more than 4,800 pounds (2,170 kg) of cargo, a SpaceX Dragon (CRS-13 or SpX-13) cargo spacecraft departed the International Space Station on January 13, 2018. Flight controllers used the space station's Canadarm2 robotic arm to detach Dragon, which arrived on December 17, 2017, from the Earth-facing side of the station's Harmony module. 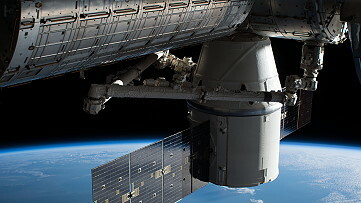 After Dragon was maneuvered into place, the spacecraft was released by a ground-controlled command monitored by Joseph Acaba and Scott Tingle at 09:58 UTC. Dragon's thrusters were fired to move the spacecraft a safe distance from the station before SpaceX flight controllers in Hawthorne, California, commanded its deorbit burn. 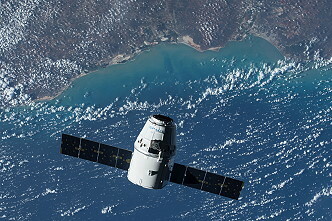 The spacecraft splashed down at about 15:36 UTC in the Pacific Ocean, where recovery forces retrieved Dragon and approximately 4,100 pounds (1,860 kg) of cargo. This includes science samples from human and animal research, biology and biotechnology studies, physical science investigations and education activities. 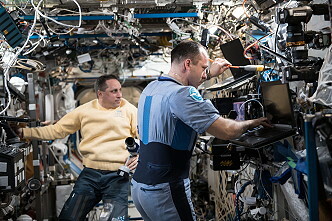 On January 17, 2018, an ISS reboost was performed using module Zvezda thrusters. 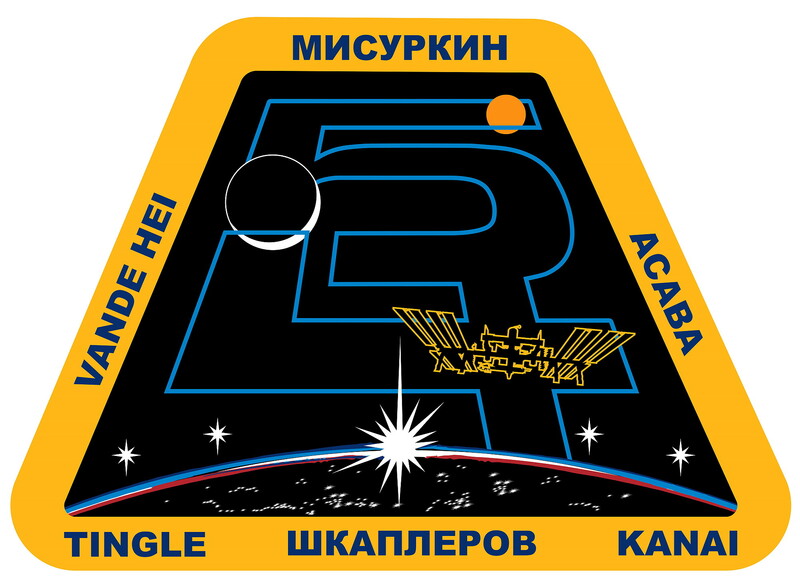 This reboost was to set up for Progress MS-08 launch planned on February 11, 2018 and the landing of Soyuz MS-06 on February 28, 2018. The engines started at 20:15 UTC and fired 15.6 seconds. The ISS got 0.24 m / sec. more speed. 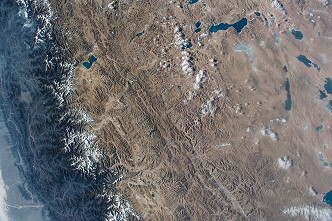 The actual parameters are 402.8 km x 422.7 km. The ISS needs 92.60 minutes for each orbit. 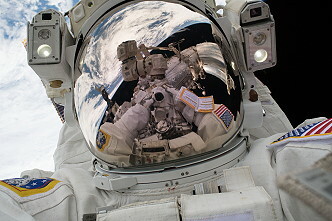 On January 23, 2018 Mark Vande Hei and Scott Tingle performed the first spacewalk (7h 24m). The objective was to replace one of two redundant latching end effectors (LEE) on Canadarm2, the station's robotic arm, which has experienced some degradation of its snaring cables. A spare LEE replaced the current LEE B. A state command error was seen during powerup of the new LEE-B on the primary string. 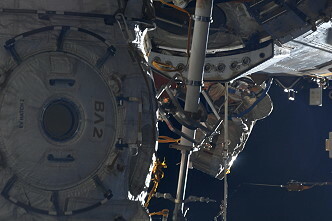 The EVA crew demated and remated the connectors, and ground teams were able to power up nominally on the secondary string but still received the state command error on the primary string. During the spacewalk on January 23, 2018, Mark Vande Hei and Scott Tingle replaced a Latching End Effector (LEE-B) on the Canadarm2 robotic arm. An issue preventing the LEE from transitioning to an operational state on one of two redundant sets of communications strings was detected. 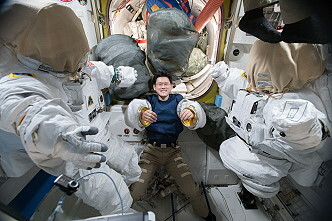 The spacewalking crew demated and remated the connectors and ground teams were able to power up the arm to an operational state on its secondary communications string leaving the arm operational but without a redundant communications string. 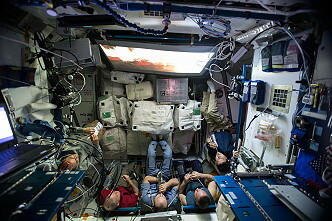 After extensive troubleshooting by teams from NASA and the Canadian Space Agency (CSA), the decision was made by space station managers to use the next US spacewalk to reinstall the LEE removed on the January 23, 2018 spacewalk to restore fully redundant capability to the robotic arm. International Space Station officials have postponed the spacewalk on January 29, 2018 to swap latching end effectors (LEEs) on the Canadarm2 robotic arm. 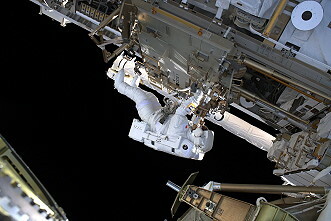 The decision was made after the Canadian Space Agency (CSA) and its robotics specialist team developed a diagnostics software patch confirming an anomaly noted in a primary communications string on the spare end effector installed during a prior spacewalk January 23, 2018 was not hardware related, and can be corrected through the implementation of software. A confidence test verifying the software upgrade was successfully completed on January 27, 2018 night. On January 30, 2018, an ISS reboost was performed using module Zvezda thrusters. This reboost was to set up for Progress MS-08 launch planned on February 11, 2018. The engines started at 15:25 UTC and fired 22.8 seconds. The ISS got 0.35 m / sec. more speed. The actual parameters are 403.2 km x 424.3 km. The ISS needs 92.60 minutes for each orbit. 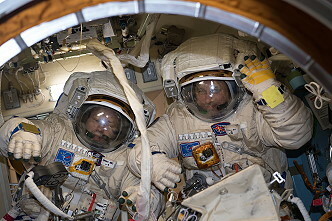 Russian cosmonauts Aleksandr Misurkin and Anton Shkaplerov performed the second spacewalk on February 02, 2018 (8h 13m). 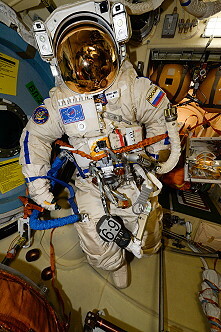 The primary objectives during the spacewalk were to remove and jettison the ShA-317A-II radio receiver for the "Lira" high-gain communications antenna on the Zvezda service module and install an upgraded electronics box to communication between Russian flight controllers and the Russian modules of the orbital outpost. 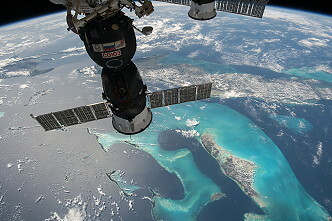 The installation will allow in the future providing almost round-the-clock two-way transmission of information from the Russian segment of the ISS to ground tracking points through the satellites of the Russian multifunctional retransmission system Luch. Next they retrieved the experiments "Biorisk" and "Test" from the module Pirs. 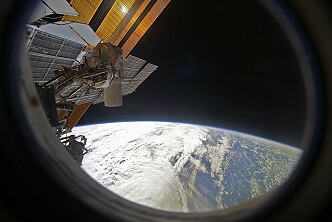 The cosmonauts also took detailed photos of the exterior of the Russian modules, especially a material experiment container. Objective: Acquisition of new data on possible manifestations (boundaries) of phenotypic adaptation and genotypic changes in bacterial and fungus associations forming a typical microbiota of structural materials used in space technology. Task: Accommodation and exposure of Biorisk-MCH containers outside the pressurized compartment, and of Biorisk-KM sets and Biorisk-MCB containers inside the internal volume of the ISS Service Module. Biorisk-KM trays are retrieved once a year, Biorisk-MCB and Biorisk-MCH containers are retrieved each half year. Objective: Making chemical, toxicological and microbiological analyses of samples taken from the external surface of the pressurized body on multilayer thermal insulation (MLTI) and under MLTI in the deposition areas of aggressive products of life-support systems and components of the own outer atmosphere. Task: Sampling during extravehicular activity (EVA) for the assessment of the contamination hazard and correction of measures for safety assurance. The launch of the unpiloted Russian Progress MS-08 occurred on February 13, 2018 at 08:13:33.233 UTC from the Baikonur Cosmodrome in Kazakhstan. 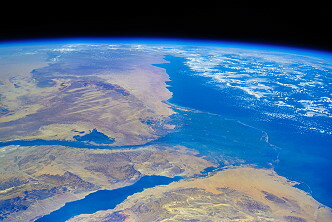 The freighter delivers 2,494 kg of food, fuel and supplies to the International Space Station (1,390 kg of "dry cargo", 890 kg of propellant in the refueling system tanks, 420 kg of water in Rodnik systems tanks, as well as 46 kg of bottled compressed oxygen, scientific equipment including the Icarus flight model and components for the life support system, as well as containers with food, clothing, medical supplies and personal hygiene items for the crewmembers are stowed in the cargo compartment). 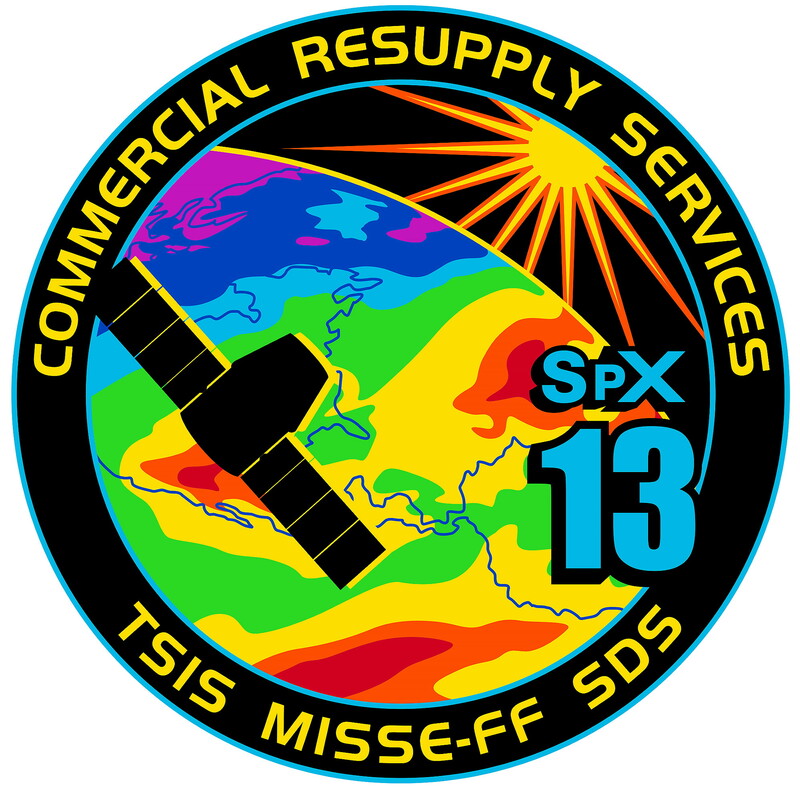 A first launch attempt on February 11, 2018 was scrubbed only a minute prior launch due to technical problems. 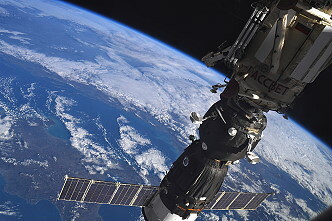 The spacecraft docked two days later to the Zvezda service module of the space station on February 15, 2018 at 10:38:42 UTC. Progress MS-08 will spend almost six months docked at the station before departing in August 2018 for its deorbit into the Earth's atmosphere. For the third EVA Mark Vande Hei and Norishige Kanai left the International Space Station on February 16, 2018 (5h 57m). 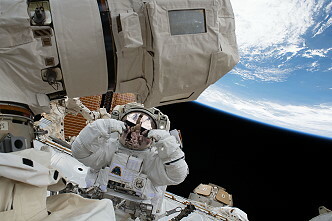 The two spacewalkers moved a Latching End Effector (LEE), or hand, for the Canadian-built robotic arm, Canadarm2, from a payload attachment on the station's Mobile Base System rail car to the Quest airlock. This LEE was replaced during an Expedition 53 spacewalk in October 2017, and will be returned to Earth to be refurbished and returned to the orbiting laboratory as a spare. 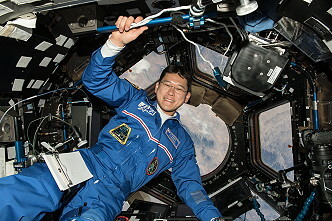 They also moved an aging, but functional, LEE that was removed during a January 23, 2018 spacewalk from its temporary storage outside the airlock to a long-term storage location where it will be available as a spare part for the Mobile Base System, which is used to move the arm and astronauts along the station's truss structure. The spacewalk originally was scheduled January 29, 2018 but was postponed when a new LEE installed during the January 23, 2018 spacewalk encountered startup issues. Those issues were resolved January 27, 2018 through software updates written by Canadian Space Agency robotics specialists. 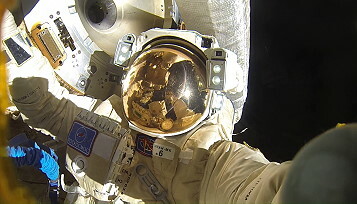 Finally the station command changed from Russian cosmonaut Aleksandr Misurkin to Russian cosmonaut Anton Shkaplerov. 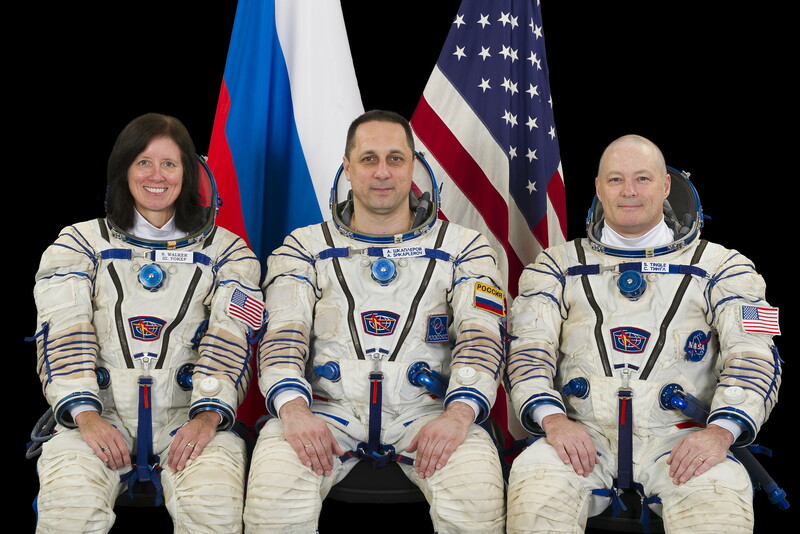 With undocking of Soyuz MS-06, carrying Aleksandr Misurkin, Mark Vande Hei and Joseph Acaba, on February 27, 2018 at 23:08:36 UTC the Expedition 54 concluded and the new ISS Expedition 55 began. Antibiotic resistance could pose a danger to astronauts, especially since microgravity has been shown to weaken human immune response. 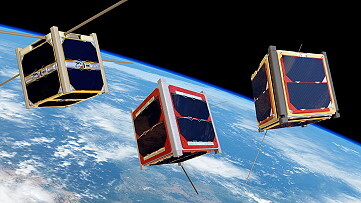 E. coli AntiMicrobial Satellite (EcAMSat) will study microgravity's effect on bacterial antibiotic resistance. The experiment will expose two strains of E. coli, one with a resistance gene, the other without, to three different doses of antibiotics, then examine the viability of each group. 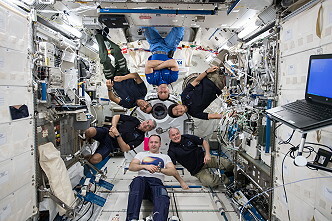 Results from this investigation could contribute to determining appropriate antibiotic dosages to protect astronaut health during long-duration human spaceflight and help us understand how antibiotic effectiveness may change as a function of stress on Earth. 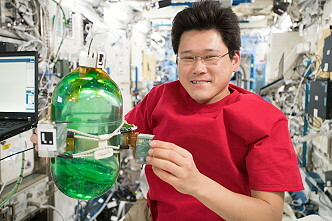 Optical Fiber Production in Microgravity (Made in Space Fiber Optics), a U.S. National Lab investigation sponsored by the Center for the Advancement of Science in Space (CASIS), demonstrates the benefits of manufacturing fiber optic filaments in a microgravity environment. This investigation will attempt to pull fiber optic wire from ZBLAN, a heavy metal fluoride glass commonly used to make fiber optic glass. When ZBLAN is solidified on Earth, its atomic structure tends to form into crystals. Research indicates that ZBLAN fiber pulled in microgravity may not crystalize as much, giving it better optical qualities than the silica used in most fiber optic wire. Results from this investigation could lead to the production of higher-quality fiber optic products both in space and on Earth. NASA's Total and Spectral Solar Irradiance Sensor (TSIS) will measure the sun's energy input to Earth. Various satellites have captured a continuous record of this solar energy input to Earth since 1978. TSIS-1 sensors advance previous measurements with three times the accuracy, enabling scientists to study the sun's natural influence on Earth's ozone layer, atmospheric circulation, clouds, and ecosystems. These observations are essential for a scientific understanding of the effects of solar variability on the Earth system. Last update on February 06, 2019.